I’ve stepped into a coffee shop to write for an hour having just deposited a ring in a gem stone shop close by … one I’ve stepped inside of on several trips over the years … perhaps another of the Chao Phraya river’s secrets that linger on in the enclave of side streets and alleys that still reveal something of the community and the intensity of old Bangkok life. 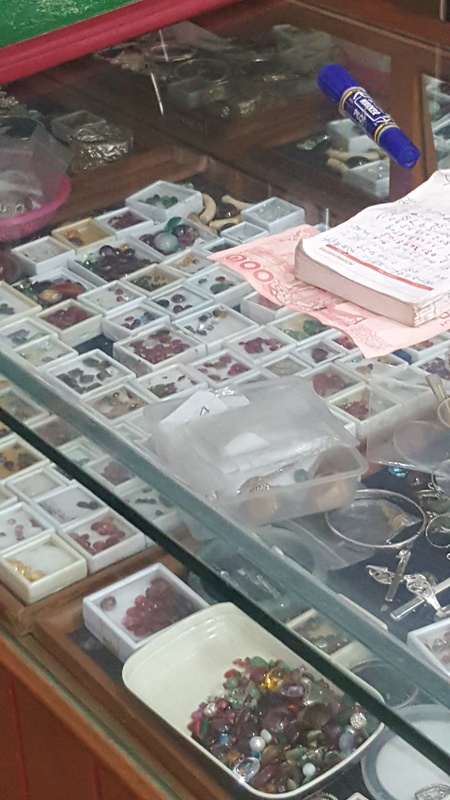 The shop, though small, is laden with the grime of a garage, the glass cabinets lazy of seeing the light of day, and the assortment of rings cast upon surfaces as one may scatter seeds or ashes. They seemingly lie there gathering ever more dust until lifted, picked, or plucked back into the light for polishing and revelation, of a kind. 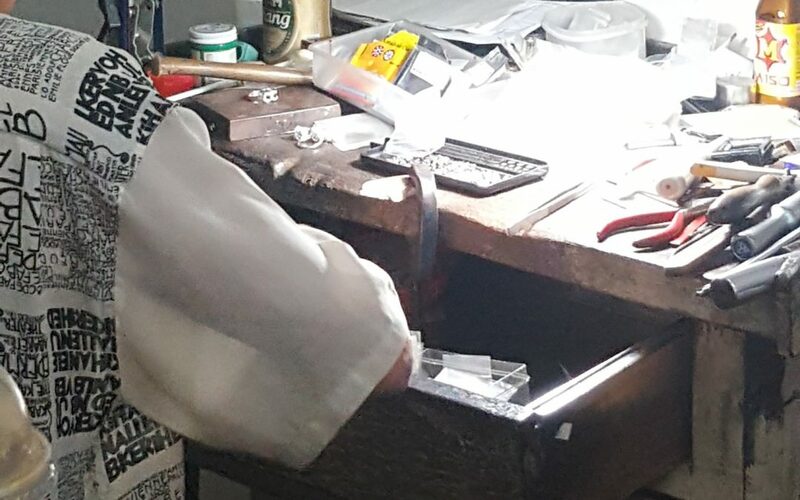 The jeweller’s implements appear centuries old, and the craftsmen are more akin to coal-labourers than gifted jewellers and bringers of light to forgotten stones. I’ve given over the ring with the lemon stone—one I sometimes wear on my left little finger—to replace two missing stones. They are likely diamante or somesuch, and the man through magnifier and mask has searched out from the depths of many stones, two fitting matches and they are carried upon tarnished tray into the back of the shop where lies a workshop, grimier than the front where men at desks create, and replace, replenish and reveal their beauty. 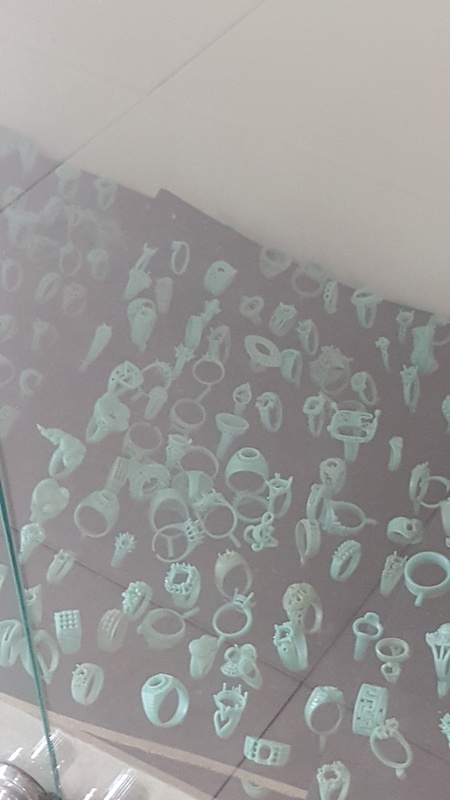 The skeleton rings are luminescent green, and the stones are chosen to fit within the framework of these disguised bones. When first I found the lemon stone central to this ring, the craftsman presented it with a skeleton that it may well fit, providing it fitted my finger, and then he showed me the caskets of seeming grit which would fill the other holes. Truly a revelation that beneath the ‘discolouration, and the heavily laden grime’ could emerge such beauty and light. All these jewels waiting to be discovered and brought back to their true selves, true brightness and glory by these seemingly gifted magicians. 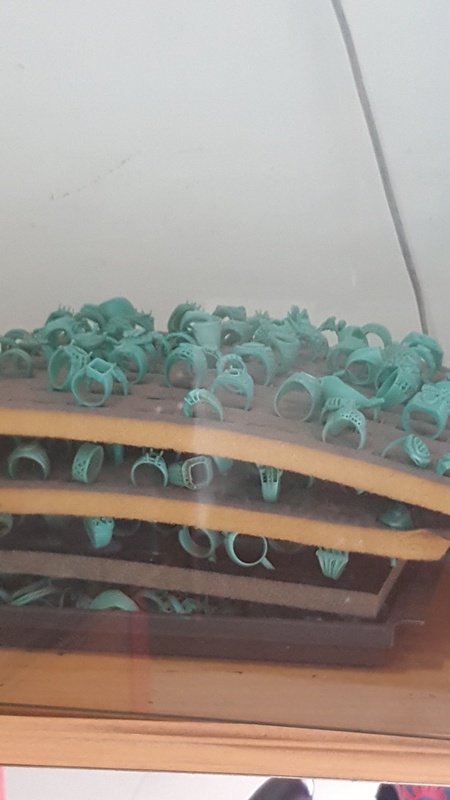 His shop is likely judged by the hazy, windows, the scattering of abandoned rings, for I have only ever seen Indian buyers there before, and no other Farang (foreigner). Whilst lingering awhile, while he ascertains the price for fixing the stones and polishing them, I find in the depths of the dust a complete ring with orange stones – like a Damascene (Syrian) ring I have, with an orb packed with stones. It is identical but smaller and the stones distinguished by their extraordinary orangeness. I motion for the magician to open the casket buried in pollution and blur. The ring is a perfect fit, and so unusual. Perhaps he is the Frog that turns into a Prince? On the calculator he gestures that it is 1500 THB and I gesture ‘polish’ too. He agrees and I am here awhile for the transformation to take place in the darkness of that workshop wherein darkness truly transforms into light. The jeweller reveals the true beauty of the stone and always with a knowing that the beauty is there to be revealed. Are you ready to discover the Jewels within you? Hypnosis and therapy may well be the answer to discovering the diamonds within you just waiting to be discovered in you.